This is the first book in the Softwire series. 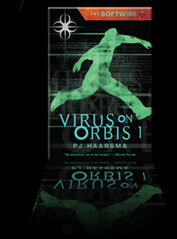 It is a YA series written by Canadian author PJ Haarsma. I found it as a free download on Kobo a few days after I bought my BlackBerry Playbook. It is the story of a group of children who are travelling on a generational ship (travelling for hundreds of years) and for some un-explained reason, all the parents are dead. They have mostly been raised and educated by the computer systems on the ship. The voyage ends and the children are landed on the first ring of the group of planets of Orbis. Here they have to work to earn the keep that their parents had contracted. It is once they start their forced labour that their difficulties really begin. I loved this book. I found it hard to put down once I started reading. I think I finished it in two sittings. I love books with space travel as I am fascinated with new cultures and what a better place to consider how to construct a culture than on a new planet. I feel that this book will appeal to young readers. First of all, they have no parents, in fact, they never knew their parents. Second of all, it's the kids who end up having the power and the ability to resolve the major dilemma that ensues. Author PJ Haarsma is the founder of the Kids Need to Read Foundation. The Foundation "works to create a culture of reading for children by providing inspiring books to underfunded schools, libraries and literacy programs across the United States, especially those serving disadvantaged children." I have included a link to the foundation website so you can learn more about this worthy cause. Bookcover photo courtesy of PJ Haarsma's website. Hi Heather, that sounds like a really good book. I still find myself being drawn to books aimed a young adults. I always wonder what that says about my actual level of maturity as compared to my actual years (50). 8) I'll have to look for it. Thanks for your kind words about my 9-patch. I'm going to try to get it quilted very soon.